Essential oils don’t only smell great, but they can help you feel great, too. Nature packs healing phytochemicals into plants, from the nutrition and antioxidants in the plants we eat to the uplifting and anti-bacterial properties of essential oils. Essential oils have been used throughout history and by many different cultures for medicinal purposes. (Remember frankincense and myrrh in the Bible? These pungent tree sap resins have been valued for centuries for their fragrance and therapeutic uses.) Essential oils are obtained from plants, usually through a distillation process. The oils can be used for both aromatherapy and massage. Their quality can vary, so be sure to purchase oils processed without chemical fillers or additives. According to the National Institute of Mental Health, depression affects 18.8 million American adults in any given year. The Journal of Clinical Psychiatry reports that anxiety disorders cost the U.S. more than $42 billion per year. This a third of the $148 billion of total mental health expenditures, according to the Anxiety Disorders Association of America. Drugs prescribed for depression and anxiety can present a host of unwanted side effects that range from fatigue to violence and suicidal thoughts. Experts are concerned about the use of antidepressants for children. Luckily, nature has answers for those suffering with depression and anxiety disorders. Many colorful tales are told about the use of essential oils to prevent illness. Many of them center around the time of the Bubonic Plague in Europe. It’s said that herbalists managed to escape the plague. This was attributed to their constant inhalation of the plants’ aromatics. One story talks about a concoction of herbs, spices and oils that robbers used to avoid getting sick while plundering the bodies of those who died from the Plague. Maybe they got the idea from the herbalists? In any case, if you’ve ever heard of Thieves’ Oil, that’s where the name comes from. 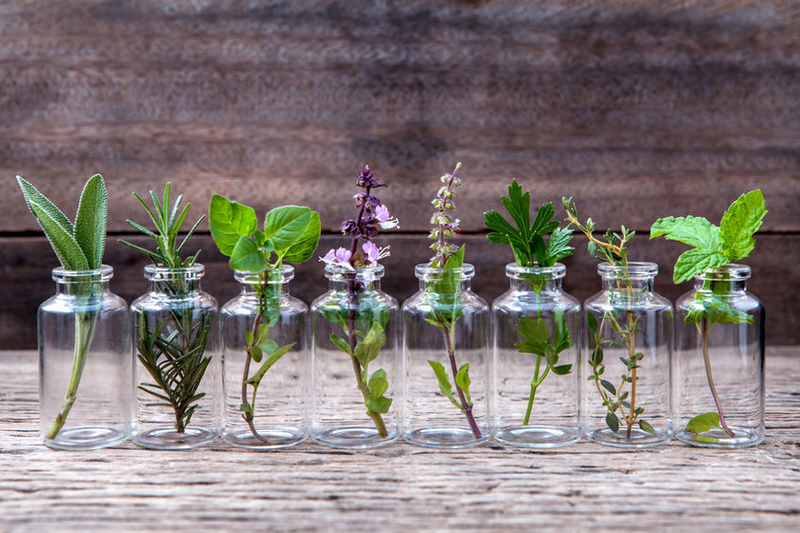 Tales aside, what we do know to be true is that essential oils have anti-microbial properties. Some, like oregano oil, are included in cold and flu remedies (and are diluted accordingly for internal use) or in anti-fungal preparations. We’ve already mentioned Thieves’ Oil, which is a combination you can put in a diffuser or use to clean your home. Since there are so many options to choose from, you can use oils with scents that are pleasing to you. The oils can be dispersed into the air through a diffuser in order to provide aromatherapy in your home or workspace. You can also apply drops to a cotton ball and breathe them in. If you use essential oils on your skin, always dilute them with a carrier oil such as almond, olive or coconut. Many massage therapists will give you a choice of essential oils to be used in your massage lotion. If you are pregnant or want to try them for your children, make sure you check with your holistic health team here at Cannizzaro Integrative Pediatric Center! Essential oils are concentrated and should be used with care. Of course, we offer therapeutic-grade oils and diffusers to help with depression, anxiety, immune health and other uses.